Over the past two years, Södra has advanced from 48 in the ranking to now occupy the top spot and thereby become the first forest industry company to receive the award. April 13, 2018 (Press Release) - Södra has been named as Sweden's most attractive employer in the world's largest employer branding survey, the Randstad Award. Over the past two years, Södra has advanced from 48 in the ranking to now occupy the top spot and thereby become the first forest industry company to receive the award. Sweden's 150 largest employers and more than 5,000 people took part in the survey. It is conducted among a broad spectrum of students, employees and job seekers aged between 18 and 65 across Sweden. “It is a great honour to receive this award and it is an accolade to all of our fantastic coworkers at Södra. Committed employees are, and will always be, what drive our company forwards. At Södra, it is not only the forest that must grow. We are a company that shows the way and where we grow together as we move into the future. There is still work to be done, but the award is confirmation that we are on the right track,” said Kamilla Svensson, HR strategist at Södra. Respondents state their opinions on an employer's reputation, financial prosperity and its contribution to society and the environment, among other aspects. These three areas are deemed the key factors for Södra receiving the award. “The survey is quite clear, Södra is a much appreciated and attractive employer. The journey to achieving this leading position in fierce competition is very impressive,” said Johan Lagercrantz, CEO of Randstad. “Strategic skills supply is a crucial issue today for all companies with a view to maintaining and strengthening competitiveness. Södra has a major focus on this in order to attract, develop and retain employees. We will now continue to work together with our 3,400 coworkers to show what it means to become a next-generation forest company,” said Christer Thörn, HR Director at Södra. Report: Randstad Employer Brand Research 2018. 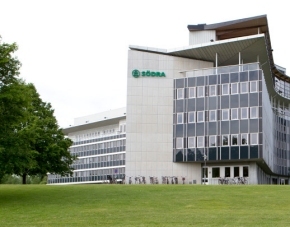 Södra, with headquarters in Vaxjo, Sweden, produces market pulp, wood products and biofuels. The company operates three pulp mills in Sweden (Mörrum, Mönsterås and Värö.) with a total capacity of 1.6 million tonnes per year. Sodra produces both softwood and hardwood pulp — 90% softwood and 10% hardwood. To learn more, please visit: www.sodra.com.